If you expect a banana bar to be dense, firm, moist and rich rather than so light and cakey you need frosting and a fork, here’s your recipe. These “Banana Blondies” are from a 1983 article by Florence Fabricant called “Over or Under Ripe, Myriad Uses for the Banana” and it’s almost perfect. The banana blondies came out of the oven brown and very soft. I could tell they’d be a gooey mess if I cut into them warm, so I waited patiently for them to cool to room temperature, then not-so-patiently chilled the bars for another hour so they’d slice neatly. Here’s the recipe as modified by me. My cook-time was also a bit longer than the original. Preheat oven to 350 degrees. Line a 9 inch square metal pan with foil and spray bottom of pan with cooking spray. Cream butter and sugar with an electric mixer. Add egg and beat for 2 minutes or until light and fluffy, scraping side of bowl often. Beat in the vanilla, followed by the banana puree. Beat in baking soda and salt. Scrape sides of bowl. Add flour and stir by hand or using lowest speed of mixer until blended. Stir in the chocolate chips and nuts. Pour batter into pan and spread to the edges. Bake on center rack for 25-30 minutes. Remove from oven and cool on a rack to room temperature. For cleaner cuts, chill an hour before slicing. Lift foil from pan, place on cutting board, Cut into 16 (or 9) squares. After making the batter as written and pouring it in the pan, melt butter in a small microwave-safe cup. Stir in 2 ½ tablespoons of peanut butter and the brown sugar. Using a teaspoon measure, drop 9 evenly spaced circles of peanut butter mixture over the batter. Drag a knife through just enough to make a swirled/pulled effect. Bake as directed. The peanut butter will develop little air bubbles after it has baked, so you’ll need to do some cosmetic enhancements. 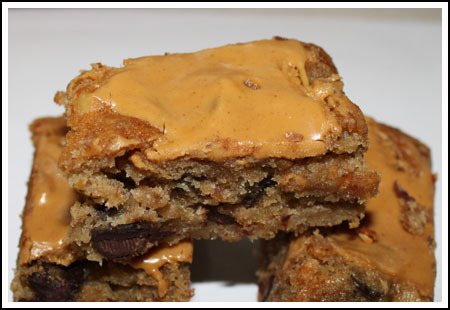 Put some more creamy peanut butter on a spoon and drop it over the hot blondies covering, as best you can, the pattern made by the baked peanut butter mixture. Let it soften a little from the heat, then gently spread it over the baked peanut butter mixture. Let cool and chill as directed above. The peanut butter version looks like this. Just got a recipe for Banana Bread Bars with a Brown Butter Frosting on them. Looks delish, but yes, they look like a cakey bar. I came looking to see what you had, Anna. These look great! Yum. I came looking for some cookies to make today and landed on this one! Definitely a winner! Katherine and Marianne, thanks for trying the recipe so quickly!! Second and third opinions are important. Yet another super way to use up my leftover bananas…which we seem to always have sitting on the counter! The peanut butter idea is a great one. Can you give me some idea what would happen if I used applesauce instead of the butter? Would it be more bread-like? Oh and hey, I like the tie-dye cupcake look on your header! Is it still just on rotation up there? Kinda fun. One of my favorite combos–banana, chocolate and pb to boot. Love the monkey. I made a similar bar a few months back that also had oats in it. These look incredible! I know I will be making them soon. For those of you who like banana as much as I do, the Trader Joe’s banana bread mix is very good. Just sub 1 mashed banana for the oil for even better tasting bread. I’ve gained ten pounds while reading this. These look delicious! I love anything banana, I have no idea why either. I’ve never had a dense banana bar. My hubby might like these! Hahaha I like the lunch box in the background! 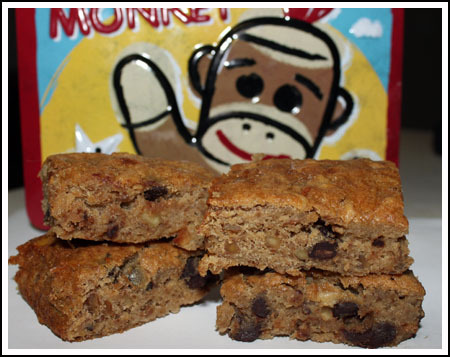 These bars sound right up my alley with banana AND chocolate :). anna these look so good! i am totally making these. i have an emergency baking question: trying to make a rasp-cream cheese swirl for the middle of a basic (white flour) muffin. how do i do this w/out it sinking to bottom? should i put cornstarch in the raspb? Chocolate, peanut butter and bananas. Great combo!